Some anti-virus or security applications may interfere with your Linksys E/EA-Series installation. In order to perform the installation without any interruption, it is recommended that you temporarily disable your anti-virus or security application. Once you complete your Linksys E/EA-Series installation you may then re-enable your anti-virus application. 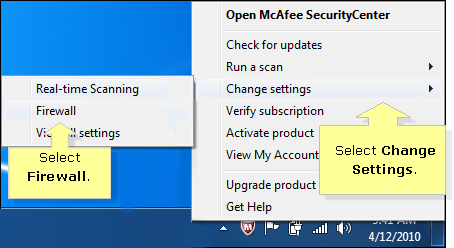 Right-click the McAfee icon at the bottom-right corner of your Windows Desktop. Select Change settings > Real-time Scanning from the menu. In the Real-Time Scanning status window, click the Turn off button. You can now specify when you want Real-Time Scanning to resume. It is recommended to select When I restart my PC from the drop-down menu. Click on the Turn off button to confirm your selection. McAfee AntiVirus has now been successfully disabled until the next computer restart. Select Change settings > Firewall from the menu. In the Firewall status window, click the Turn off button. You can now specify when you want the Firewall to be automatically turned back on. It is recommended to select When I restart my PC from the drop down menu. Click on the Turn off button to confirm your selection. Your McAfee Firewall has now been successfully disabled until the next computer restart.